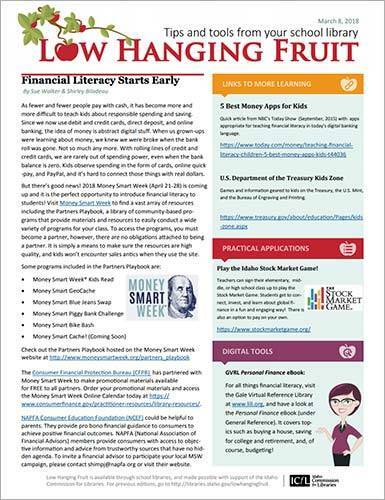 Spread the news in your building and community about the happenings in your own library using the Page 2 template for Low Hanging Fruit. Save the template to your computer, and then create! Move the boxes around, change the headings, insert images, and use the text boxes provided however you wish. When it looks just right, convert it to PDF and send it along to your staff with LHF Page 1. You can send it to email boxes, or make 2-sided copies with LHF Page 1 to put in faculty mail boxes. Put it in the staff room, tack it up on bulletin boards, send it home with students, or use it however you will! Feel free to contact us with questions at jeannie.standal@libraries.idaho.gov or allison.floyd@libraries.idaho.gov. For those of you without MS Publisher, we are working on another solution for you.